California’s biggest water project in decades appears to be in limbo after a key irrigation district voted not to help underwrite Gov. Jerry Brown's plan to build two giant tunnels that would re-engineer water transport in the state. For the last 75 years or so, we’ve tried to figure out how to move water from north to south. The no-vote at the Fresno-based Westlands Water District — the largest agricultural water supplier in the U.S. — puts the $17 billion project's funding on shaky ground. Will other water districts pick up the slack? Other large water agencies considering participating in the project are set to vote soon. Another key player, Los Angeles' Metropolitan Water District , will vote on October 10. The Santa Clara Valley Water District, based in San Jose, will weigh in a week later. But with the loss of Westland's support, some are left wondering if the controversial project is already doomed. 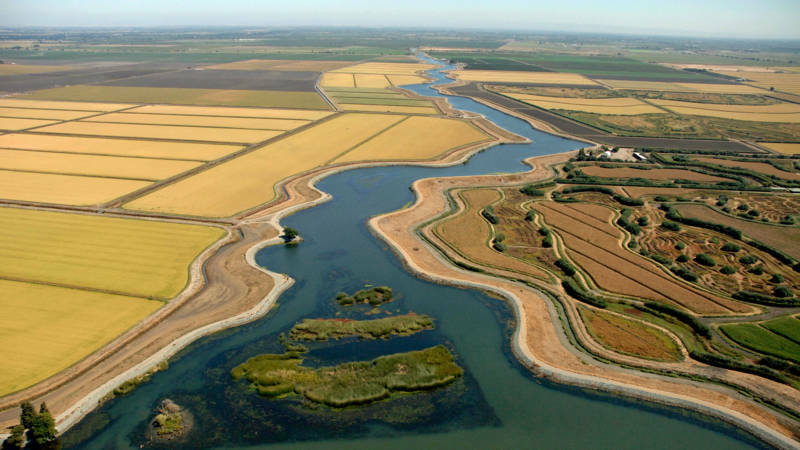 KQED's Brian Watt spoke with Paul Rogers, managing editor for KQED's Science unit and the environment writer for the San Jose Mercury News, about the delta tunnels project and what may lie ahead. Brian Watt: This is a project that is touted as benefiting both the delta environment and water consumers. Remind us how these delta tunnels are supposed to work. Paul Rogers: When you talk about water in California, the big picture is that three-quarters of all the rain and the snow falls in the northern part of the state and three-quarters of the people live in the south. So, for the last 75 years or so, we've tried to figure out how to move water from north to south. Right now, in the delta we have these giant pumps near Tracy. What happens is when we pump water south, they grind up and kill fish like salmon and smelt and as those species have gotten endangered, less water at certain times of the year. 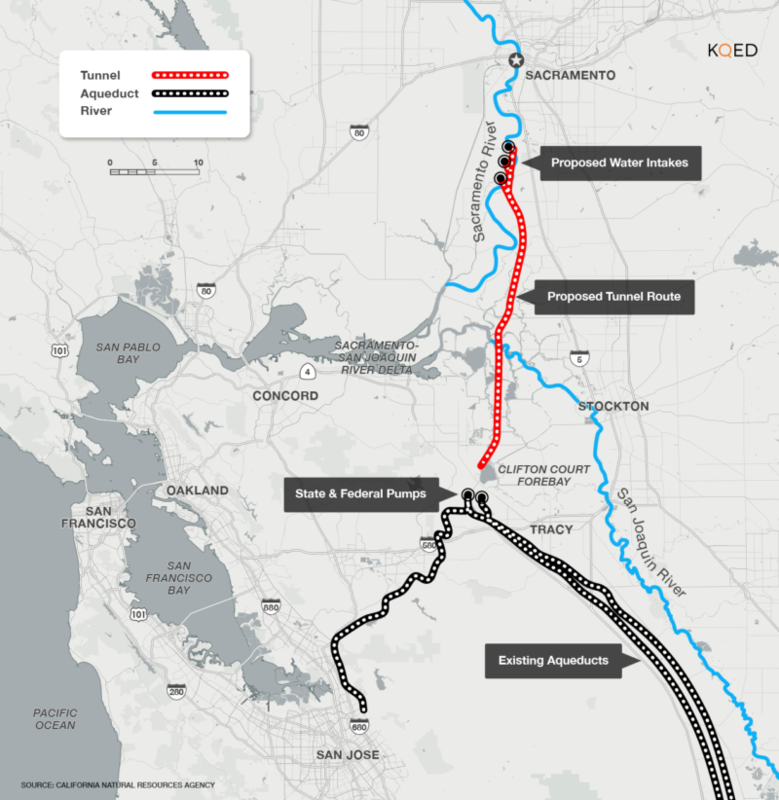 So, Jerry Brown's idea is let's build these two tunnels, 40-feet high, costing three times what the Bay Bridge costs, to take the water from farther north in the delta and rely on these pumps less, so people can get the water more reliably. Watt: The project has had some pretty vocal opponents. : some environmentalists, some members of the delta's congressional delegation. But why did a huge farm irrigation district, Westlands, pull its support when its customer were supposed to benefit from it? Rogers: It's a great question, you know, environmentalists have been against this thing all along. They argue that if you build these giant tunnels, it'll make it easier for big corporate interests in the Central Valley and Los Angeles to take northern California's water. But some of those farmers in the Westlands Water District near Fresno, their board voted recently, 7-to-1, to pull out of this plan. They were supposed to pay three billion of the 17 billion-dollar cost. They decided not to because, number one, it was a huge amount of money and it was going to raise what they paid for water. Number two, they weren't being guaranteed by the Brown administration they were going to get any more water. That no-vote sent shock waves across the California water world because it meant the other agencies that might want to participate were going to have to pay a lot more. Watt: So the Metropolitan Water District in L.A. has a big vote coming up on October 10. What do you think is going to happen? Rogers: Some of the folks down there on that board have been raising questions about the cost. I think if I had to handicap it, I'd say that there's probably about a 75 percent chance that they'll vote for it. So that'll be a big win for Governor Brown, but that doesn't mean the project is done because there are other water agencies, like the Santa Clara Valley Water District in San Jose that still have yet to vote. Brian Watt: So, where does this leave the project now? State water agencies and other big supporters say it's far from dead. Rogers: It's just fascinating. I think there have already been more than a dozen lawsuits filed against this project and even if water agencies approve it, it's probably going to be held up in court for years. The Santa Clara Valley Water District is sort of wobbling. I think they may want a smaller project. So, it's still hardly a sure thing. Jerry Brown leaves office in 15 months and his successors -- his likely successors -- are not huge supporters of this. They're not opponents, but they're not embracing it the way Brown does. So, I think in the next few weeks we're really going to see whether or not this thing has a chance of being built or whether the final stake is driven through its heart. Watt: What does Governor Brown think of this? Rogers: You know, it's worth remembering that Governor Brown has two giant legacy construction projects: high speed rail and this tunnels project. His dad built a lot of big things around California when he was governor in the '60s and this is Brown's attempt to do that.